Didn’t expect this did ya? Here’s a very special gift from the depths of Wayback Machine; my first EVER review! 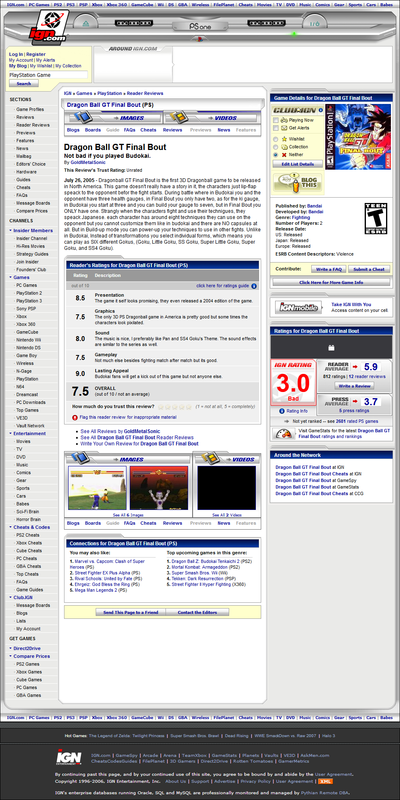 Written wayback on July 26th, 2005 at IGN’s Reader Reviews section! The site’s changed a billion times over the last decade plus and the section no longer exists natively. Thanks to Wayback Machine, I was able to dig it up, and screen-cap it in its original glory, typos and all! I was 16 at the time and at my peak Budokai craze so I was VERY easy on the game despite its obvious poor quality (bar the music, that’s ABSOLUTELY amazing!). So with that, click on and have a look at the image with its Wayback Machine link at the end. Click the image to load it in a new window/tab for the full size!